This week saw our Taste the Cracklin team visit Leamington Spa for a party like no other. The town itself is full of impressive Georgian and Victorian architecture and there are some beautiful gardens to visit (although we only got chance to see them through the van window on this visit). It’s always exciting to visit new places and meet new people and you pick up some random facts along the way. Did you know that Royal Leamington Spa (people usually drop the ‘Royal’) is named after the River Leam which flows through it? We were contacted at quite short notice to provide catering for a house party for students in Leamington Spa. One of their housemates had to head back home on short notice and her friends wanted to provide something exciting that she could remember. In typical student style, only a handful of guests were invited but hundreds turned up. Luckily, our Taste the Cracklin hog roast team were warned about the likelihood of this and we were more than prepared. The students had found our website and were surprised by the services we offered. Luckily, when they contacted us, we did have availability and we were more than happy to cater for the event. While this was a sad occasion for the housemates and their friends, they celebrated in true student style – it was in the early hours of the morning that we finally cleared away and left. 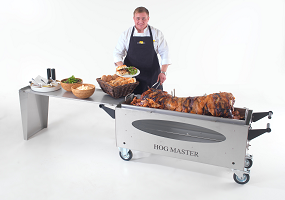 What made our hog roast catering so appealing to the students was our fabulous menu and our guarantee that all our rubbish is taken away with us. The group of young people told us that previously they had hired caterers who had left such a mess afterwards that they were reluctant to hire catering again. However, after a brief look at our menus, they decided we looked like just what they needed. While the party chose our simplest party menu, they were overjoyed at how perfect it was for this event. Our wide selection of menus for corporate events, parties and weddings ( as well as any other celebrations you can think of) means that we have selections for every occasion, no matter what the budget, venue or number of guests. Our ‘Pig in a bun’ menu offers great value for money and is an unbelievable tastier alternative to dry, cold party food. Our gorgeously roasted hog is a sophisticated and palate pleasing substitute for ham sandwiches and sausages on sticks and is also an unusual centrepiece for any occasion. The hog roast hire Leamington Spa team always enjoy taking on a new challenge and it was great to cater in a small home for so many people (if you’ve ever been to a student house party- you’ll know what I mean). It really proved just how versatile and appealing a roasted hog is. Hiring our catering chef to prepare, cook and carve your pig couldn’t be easier and it takes all the pressure off the hosts. Often, if you are having a party and providing your own catering, there is little opportunity to enjoy yourself. Hiring our fully qualified event catering chef means that you have someone on hand to take away the stress. Without the need for a full staff team, having our chef on site is a cheaper option but still one that gives you piece of mind during what can be a stressful time and we are always happy to help. The team are fully qualified to provide any and all levels of service, whether this be for machine hire, a buffet or a sit down meal. Not only are our hog roasts versatile but so are we! Our unique catering service makes us a brilliant option for anyone who wants to make their celebration special. The house party was enjoyed by all and I can honestly say that the presence of our hog roast and catering chef added to the electric atmosphere. Our team pride ourselves on the service we provide and the enjoyment people get from a perfectly roasted hog prepared by one of our team is often a reward which makes coming to work so fantastic on a daily basis.